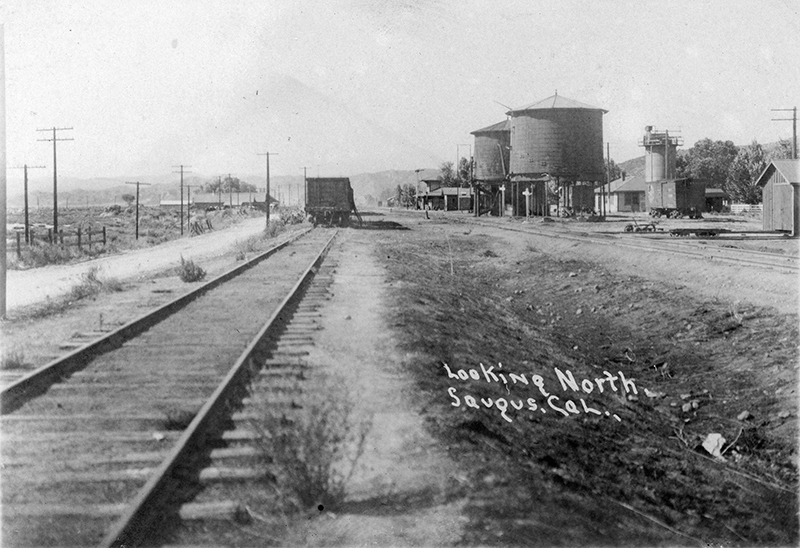 SCVHistory.com LW3053 | Saugus | Looking North Past Saugus Depot, ~1910. "Looking North / Saugus, Cal." Undated, unused sepiatone real photo postcard published by Kruxo, denominated 1 cent. Badly faded or underexposed; edited to black and white (more or less) for legibility. Undated but probably related to, and from the timeframe as, this RPPC; the two photogaphs were together as one auction lot. The view is north up the main line of the Southern Pacific Railroad. In the center of the photo, to the immediate left of the water towers, is the SPRR Saugus Depot. At this point, the 1887 Saugus spur line veers off to the left (west). LW3053: 9600 dpi jpeg from original RPPC purchased 2017 by Leon Worden; ex-Holabird auction.